This post contains major spoilers for The Walking Dead Season 7 premiere, "The Day Will Come When You Won't Be." From a certain point of view, last night's episode of The Walking Dead only had one purpose: to answer the question posed six months ago by the show's sixth-season finale. Which of our beloved heroes would face the wrath of nefarious Negan's wire-wrapped bat Lucille? This is a question we've been forced to ponder to the point of boredom for half a year now. Speculation has been rampant all but weekly in the news and across social media. Interviews with cast and crew have drummed up hype exhaustively. AMC's Walking Dead trailers and posters have exploited the mystery since the moment the Season 6 finale, "Last Day on Earth," went to air. So when we all tuned in last night to catch the seventh-season premiere live, it wasn't for the sake of flesh-eating blockbuster action or high-stakes cable drama. It was to see who'd be beaten by that. The targets turned out to be Abraham and Glenn, both common victim predictions (tending to rank dead last on survival-odds surveys), but still painful and bold. Abraham has felt expendable for some time -- likable though he certainly is. Glenn, on the other hand, is second only to Daryl in terms of audience affection, making his death really count. Steven Yeun has been with the series from the very beginning, and it's a testament to his fine work that, even though his murder-by-bludgeoning followed the source material to the word, the execution was absolutely shocking. This may have been the answer many of us had been expecting since April. That didn't make it any easier to hear. The mystery was solved and the question was answered. But what's interesting about last night's premiere was just how many other questions it posed. How will the people of Alexandria feel about working under Negan? How will the group adjust to a life of slavery? How hard will it be to meet Negan's demands, and will he even play nice if they're behaving? What will people think of Rick now that he's admitted defeat? Is Rick even still fit to be their leader? 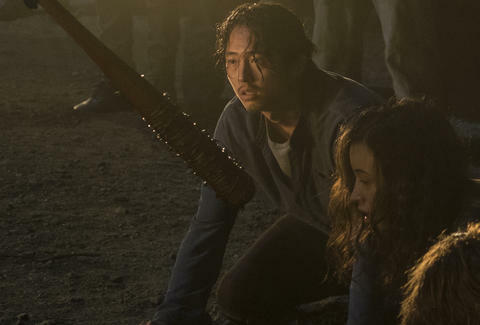 What happens now that Abraham and Glenn are dead? How will the group take it emotionally? And how will they take revenge? Season 7 was never about who Negan chooses to kill, and always about what would come next. For now that's hard to say. Daryl has been taken captive by Negan, partly to discourage dissent or retribution and partly to satisfy his own interest, whatever that may be. 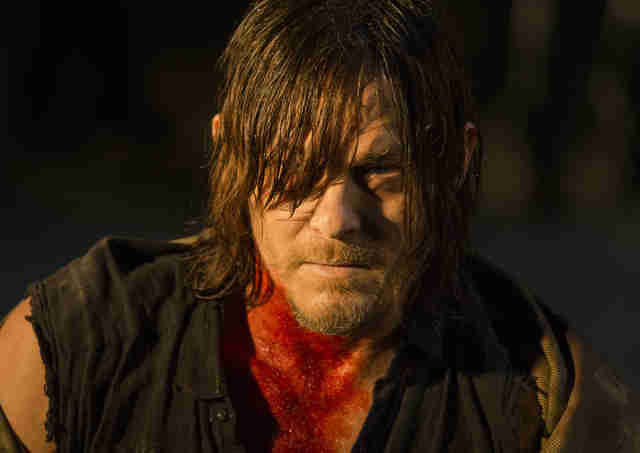 Not that Daryl's likely to take whatever Negan has planned for him lying down. Maggie, far from grieving the loss of her husband, seems to have doubled her resolve straight away: factor in the negotiating skills she showed off last season and her future as a leader of the group seems assured. (If Rick can't stand up to Negan, maybe Maggie can.) Young Carl, not exactly a paragon of mental health, just watched his own father nearly chop off his arm on command. You can bet he'll carry that with him. Then there's Rick. It seems clear that Rick, however unrelenting he's been under duress in the past, has met his match in Negan. That was the episode's most surprising blow: Our hero's will has been crushed by this terrifying stranger. Rick is hardwired to dominate, to fight back, to face every challenge head-on and best it. Last night we saw that impulse essentially neutralized. Negan made Rick understand that he'd been defeated -- utterly and totally. Rick's been had. He's been emasculated. I don't think we can expect him to gird his loins and mount a counterattack next week. Negan's taken away his power, and he no longer seems to be our hero. All bets are off. The kind of certainty we had back in Season 5, when a run-in with malevolent cannibals ended in bloody annihilation almost as soon as it started, has been replaced by unpredictability. Negan is not The Governor: Part 2. He isn't underestimating his enemies. He isn't getting in over his head. He's done this before, dozens of times probably, and he's faced and beaten men like Rick Grimes so many times that no promise of revenge is going to faze him. The group can't just hatch a plan and cleverly retaliate -- not this time. For now they're going to have to live under their new boss' thumb. You might say that Negan's practically theatrical flamboyance is what makes him so intimidating. The way he smirks, guffaws, and prances as he commits sadist-level atrocities puts him firmly in the realm of cartoon supervillain, like Hannibal Lector or The Joker in The Dark Knight. But that same over-the-top verve may be what an English major would call the man's "fatal flaw." Negan, we can tell, can't do what he does without showmanship. There may be a way for our heroes to exploit that interest in the weeks to come. Not that they're anywhere near ready to. The events of this premiere rank as some of the most brutal and ghastly ever witnessed by the group on this show. They're going to need some time to digest and accept -- so whatever vengeance the show is working toward will no doubt be a long time coming. Calum Marsh is a freelance writer with a love of the undead and an eye toward the future. Follow him for more prognostication @calummarsh.